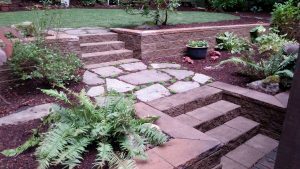 Hone Landscape Company offers Redmond landscaping including both new landscape installation and landscape renovation. People choose us for professional landscaping services in Redmond for many different reasons. Sometimes we renovate and transform landscapes for new homeowners who want to make an older yard their own. Many clients change their landscape to make it more usable or enjoyable. And of course, some homeowners opt for professional landscaping services after they buy a new construction home. Our professional team handles every aspect of the job. First, we provide the basics of grading, contouring, and irrigation systems. Next, we construct patios, walkways, driveways, retaining walls, and fencing, Finally, we install lighting, lawn, trees and plantings as the finishing touches in beautiful yard. You’ll find that our crews have an excellent working knowledge of all aspects of landscape construction. That’s why you can trust us with your property. The Hone Landscape team uses materials like pavers, rock, flagstone, and stamped concrete to build beautiful sidewalks, patios and driveways. Also, rock outcroppings are a great way to add steps and other interesting features to any outdoor area. Jason was very responsive to my inquiries and then came out and talked to me about what I wanted. He sent me a quote and then I asked him to come out again because I had been a bit rushed the first time and wanted to make certain he understood what I wanted. He explained what he was planning on doing based on what I had said the first time and he was right on. The work was done in a timely manner and to my complete satisfaction. I highly recommend them! They installed a new driveway, new front steps/pathway, changed landscaping in front and side yard, added lighting, and completely re-did backyard, including patio. Everything went perfect. They were very professional and showed up on time. They actually called me 2 weeks earlier than what was scheduled. It took them about 3 days to complete the work. This was the first time I had used their service and they tore out a quarter of my yard and put in a 5 foot rock wall. They also re-did the lawn. We were very pleased with the service and results. We went with Hone as Jason came up with a creative solution to accessing the area needing landscaping as well as good ideas on what to do with our problem hill. Jason also was very accommodating about answering all of our questions, coming to see us several times before the work was started. They built two Rockery walls transforming a very steep hill into level terraces for future plantings. The contract was detailed so as not to leave questions regarding the work to be performed The on site crew was very pleasant, careful with our property and hard workers. We will use this contractor again if the need arises and refer Hone Landscaping to our friends. Jason’s team is always professional. They are very responsive to our requests. Even when there are issues that arose (he helped us discovered that the drainage system that was constructed was not to plan as recorded by the council’s documentation), he would take the extra time to help us deal with the city council as well as to our builder (and fixed a broken pipe for free, which was really the builder’s fault). Going that extra yard is why we’re so happy with their service and we would recommend their service to anyone who wants the peace of mind knowing that their landscaping job will be done with care and professionalism. Tell us about your project. And remember, project estimates are always free. So call Hone Landscape Company at 425-549-0185 or contact us online.